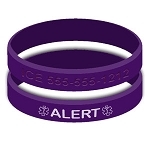 These Asthma wristband bracelets are so comfortable you will forget you even have it on. The bands are made of premium quality silicone and are latex free. They are debossed and then colorfilled white to ensure high visibility and long product life. Two medical alert symbols are prominently displayed. There is no need to take it off for sport activities. Protect yourself, your friends and loved ones today. Multi-pack includes 5 bands: Black, Blue, Green, Purple and Red. 100% Silicone - latex free! These bracelets are the best! Waterproof, comfortable, can matchup to your outfit & both my allergist & lung specialist were impressed with them. I got them smaller than I thought I should, but they fit great! Didn't want them slipping off if I was in water. Highly recommend for anyone!! Fast shipping, item as described, highly recommended!